My name is Jerry Bonk. I was born in Chicago Illinois in 1937. In 1962, after being discharged from the Air Force, I married my wife Rose in Syracuse NY and she is still with me today. We have 4 boys and 8 grandchildren. 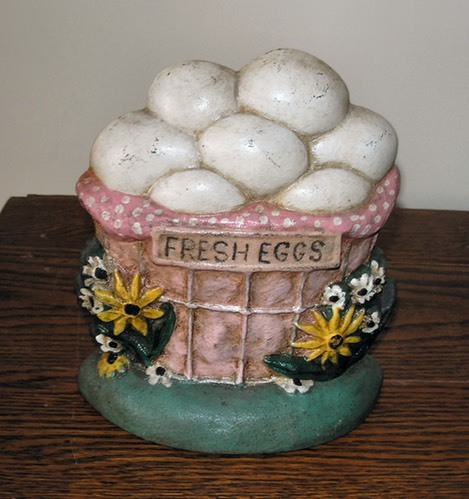 I started my antique business, Lakeside Antiques, part time around 1970 and went full-time in the mid-1980s. 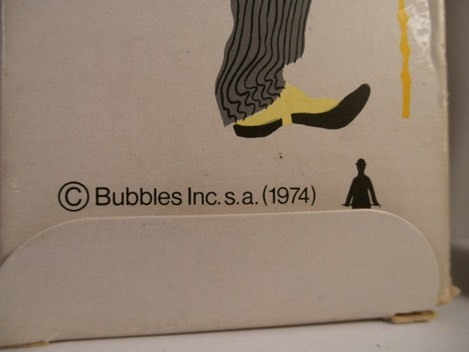 I retired from the antique business in 2002 when I turned 65. 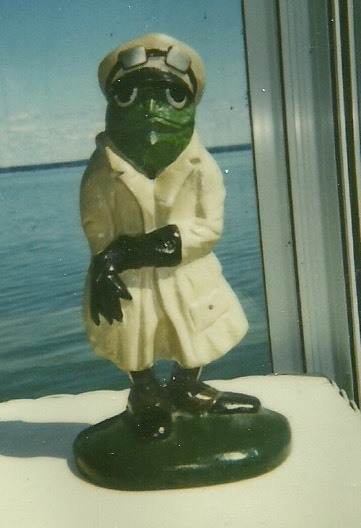 I produced a number of doorstops in the 1980s. My company was Lakeside Art Products (LAP) and I was in business from 1986-1991. In the early 1980s I made a number of other original doorstops with various back markings and some unmarked. I made the Coldwater Foundry ones, the Jack O Lantern and a Snowman. I also made the Charlie Chaplin and the Shirley Temple plus a Halloween Pumpkin Girl similar to the original [Littco] but with a longer base. I also made the original Mr. Peggotty & Little Agnes in the early 1980s. Where did you produce your doorstops? I worked LAP out of my home in Cicero NY, near Syracuse. 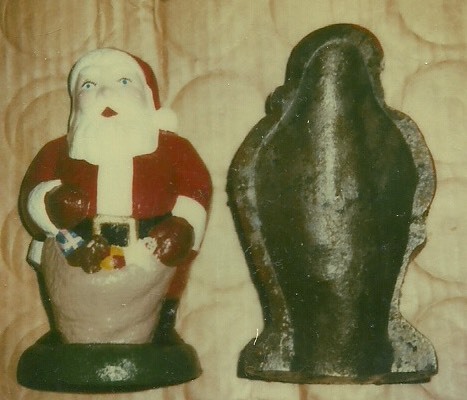 The first doorstops were cast in a small foundry in Auburn NY, but the later ones (the LAP ones) at a large foundry in PA. I forgot the name but it was near Gettysburg. In the 1990s China started flooding the US with cheap cast iron items including doorstops. There were 4 or 5 small companies still making doorstops in 1990. The Chinese iron killed most of the small foundries and doorstop companies, including mine. There was a huge increase in doorstop collecting during the 1980s after the first doorstop price guide book came out [Doorstops, by Jeanne Bertoia, 1985]. Tom Breen and I collaborated on a proposed book showing all the doorstops made during the 1980s. This would have been a great guide for today’s collectors but the book deal fell through and I sold off my collection from this era. 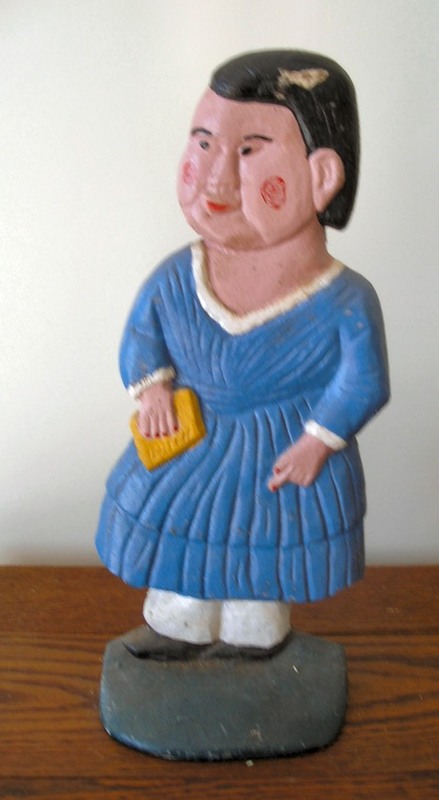 Folk artist Tom Breen produced a lot more original doorstops than I did, and I will tell you more about him later. The Lakeside Art Products was in business from 1987 to 1991. I also made 10 or 12 other independent doorstops from around 1982 to 1986. 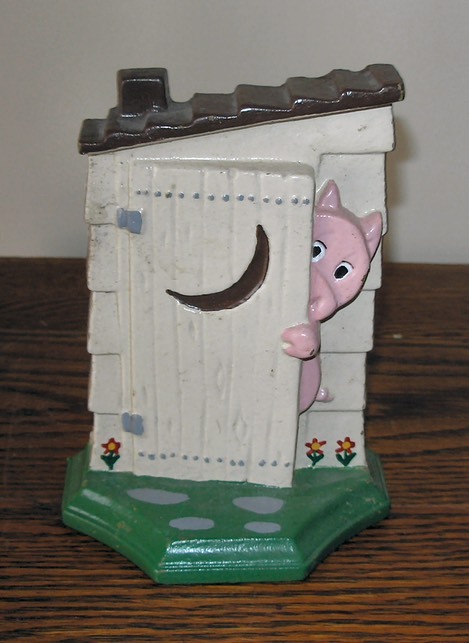 I made no doorstops after 1991, but I made a lot of other items including a line of china Pie Birds/Vents. I was an Antique Dealer (Lakeside Antiques) for around 50 years and also ran a few Auctions. That is where I got my interest in old things. What doorstops did you design? In the LAP series, the first one is Mr Toad from Disney’s “Wind in the Willow”. I made a test run of around 20 but never went into production on them because I couldn't get the permission from Disney. The next is the Apple Basket. I painted them in a variety of ways but the most popular is the red apples with a blue basket. I made around 200 total, the one that you show [in the eMuseum], with the “Apples” stencil, was on around 15 of them. The 3rd one is the Strongman. I only made 30 or 40 of those. I can't give you the size or weights because I sold them all years ago. There were at least three different artists plus myself who made the models. I told them what I wanted and paid for a drawing, then I had the same artist make the model. Some of the models were wood and others were clay. None of the artists (including myself) had any training in producing molds for sand casting, but I never had any problem. If a model wasn't strong enough to make a sand casting from, then I would have an aluminum model made first. The doorstops were cast that way, one by one, and cost me $10 to $15 each. On 3 or 4 of the LAP ones, I had match-plates made by another company which allowed the foundry to cast them 2 at a time and made the casting a little cheaper. I never saved the records of the company after the required 10 years, so I have lost the information on the artists and how many castings l made. What were the first doorstops that you made? There are only 2 photos that I have of my pre-LAP doorstops. 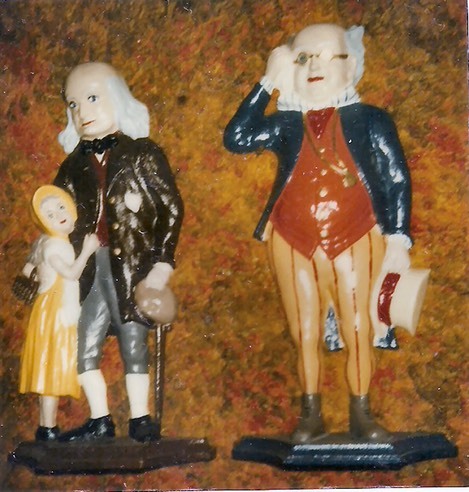 The 2 Dickens characters have my typical bases and were made from “found items” like most of my early 1980s stops. The figures were from a broken iron gate or fence, no doubt English. I had to cut & grind off the remaining iron gate pieces and I mounted them to the wood bases. I only made 15 or 20 of each one and they were all painted like the paint sample photo, except they were “antiqued” so that they didn't look brand new. They were picked up by a wholesaler and reproduced in Taiwan but painted with less detail. I started copyrighting my doorstops after that. 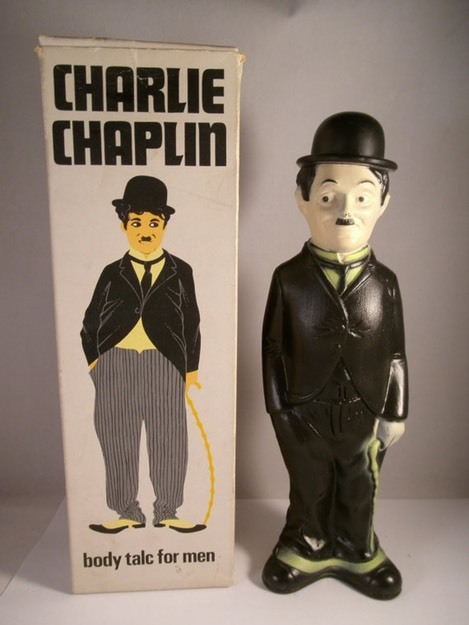 This is the bottle I used to make the Charlie Chaplin Doorstop in the 1980s. You have that one in the eMuseum. Its not necessary to tell people how I made it but this just shows you that it is not antique. I see that John Smith in his book has a full figure of this bottle (in aluminum) that he thinks is old. 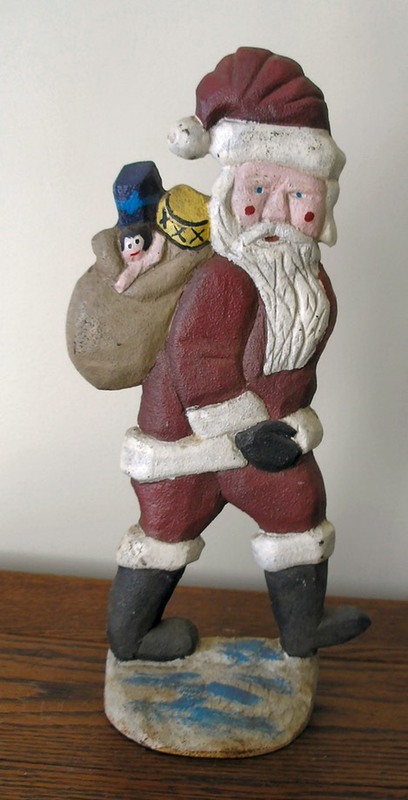 I made the “Santa” from a 1950s plastic lamp. [I also made] Shirley Temple and the Coldwater Foundry “Pumpkin Man”. I made around 12 - 15 doorstops not marked LAP. When did you meet Tom Breen? 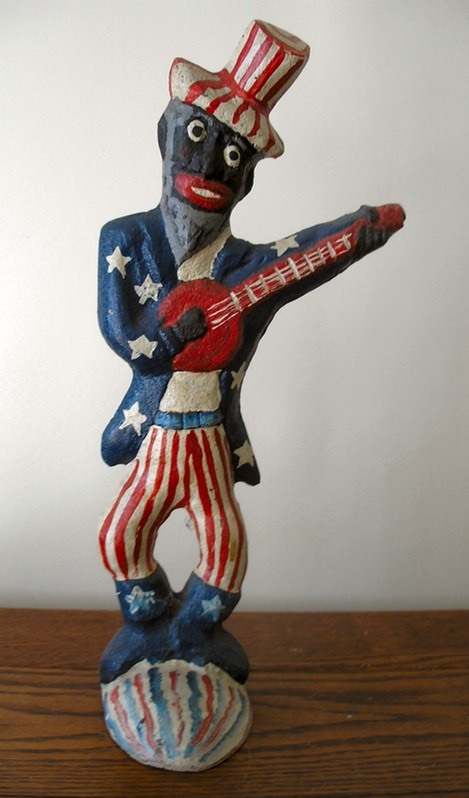 Tom Breen (1938-2011) was a folk art sign painter & wood carver from NH. I knew him for around 20 years and we both started making doorstops around the same time. Since he was a woodcarver he made a lot more of his molds than I did. His work was folksy and he didn't do faces well, but that [style] is how collectors can recognize the stops that he created. He also bought models from the same MA woodcarver that I used, so his doorstops vary greatly in style. He also signed them with a variety of names, including Hubley and B&H. 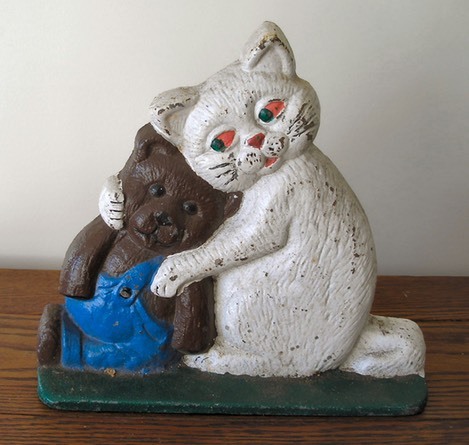 There were several people reproducing the old stops and the handful of novelty iron companies still around in the 1980s were still making the same doorstops they had made over the past 30 or 40 years. As far as I know, Tom and I were the only ones making new versions and new models in the early and mid-1980s. The [most influential doorstop expert] who knew Tom and I was John Smith, who was the one who wrote the new doorstop book in 2006. He purchased lots of Tom’s and also my doorstops at the Brimfield “Heart of the Mart” show where Tom and I set up side-by-side. 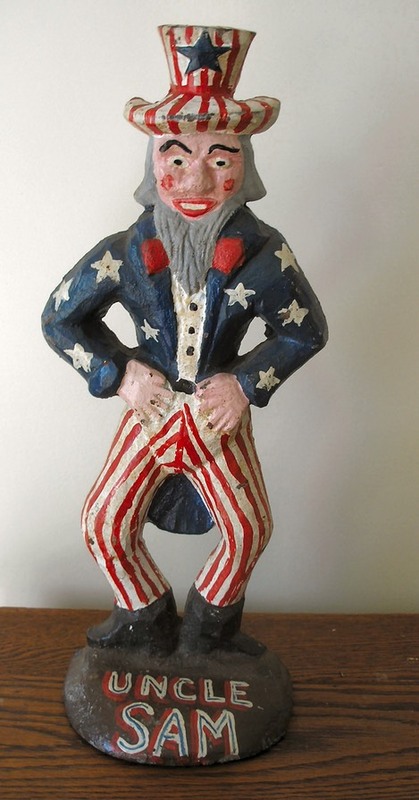 Tom’s Uncle Sam and Southern Sam are the best of his doorstops that I have and probably the best that he ever made and painted himself. His paintings and carved signs are starting to be collected, but his doorstops are not collected much yet, probably because of the confusion in the way he signed them. 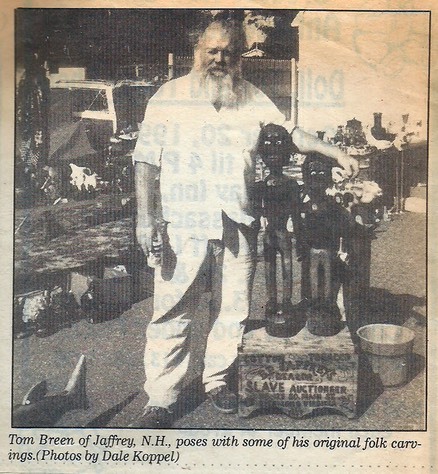 Tom never had a regular job when I knew him; he was an antique dealer and had a store in Jaffrey for a while. 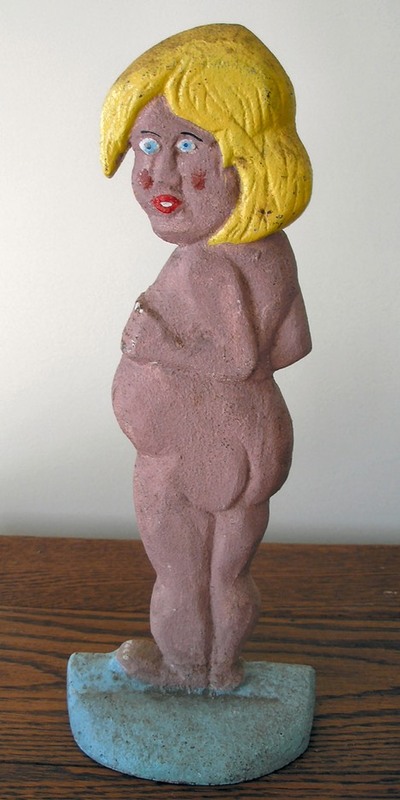 He used to enjoy picking the dump and salvage yards to make “Folk Art” out of what he found. I met Tom in the early 80s when we set up at the same Flea Market in Brimfield. He had a heavy New England accent and was carving Indians and telling jokes to the people that were watching him. He bought a lot of scrap brass from the salvage yards and he would dump that out on the ground and sell the “Antique Hardware” when he wasn't carving. That’s how he made his money. He was also a “Ladies Man” and always had a lot of girlfriends. 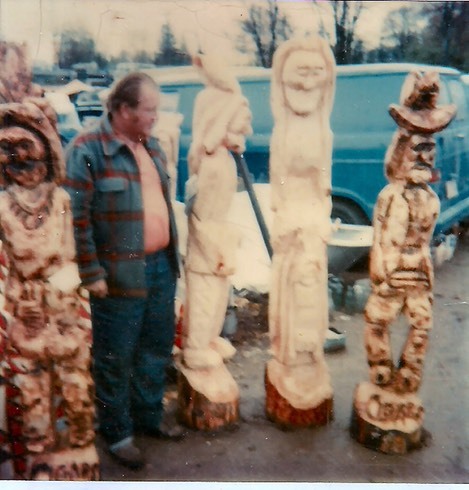 After a while he stopped carving at the shows and started making & selling signs, fish decoys, bird houses, and eventually doorstops. I would spend a few days with him in the summer when we would go “picking” for antiques up in Northern Vermont & NH. He spent the Winters in Florida and I would meet up with him. Together along with a few other dealers and artists we would rent a place for the winter and sell at the local flea markets. After I retired & stopped traveling I lost touch with him, but I know that he kept making his signs and selling them on Ebay till he died. 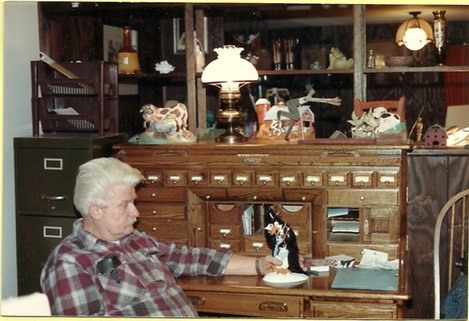 Tom Breen, with some of his wood carvings. 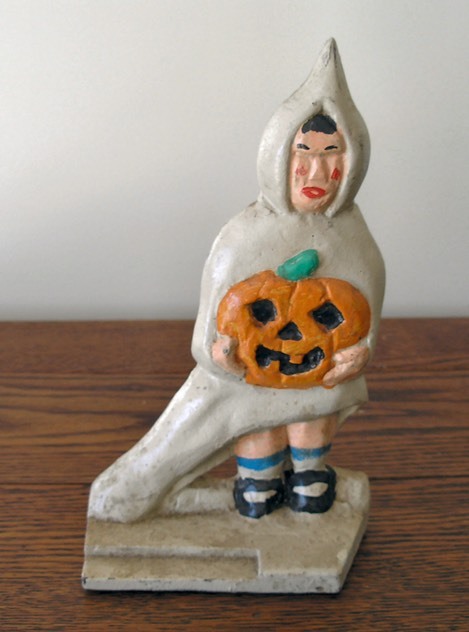 Were you the maker of my Halloween Girl, which I had identified as an “early reproduction” of the Littco original? After checking all the online images of the Halloween Girl doorstop it turns out that the base of mine was not as extended as I remembered. So the one that you have is apparently one that I had made. I also didn't know that there were only four of the old ones found and that the base was hollow. I have started checking online doorstops to see if I can spot one of mine or Toms. 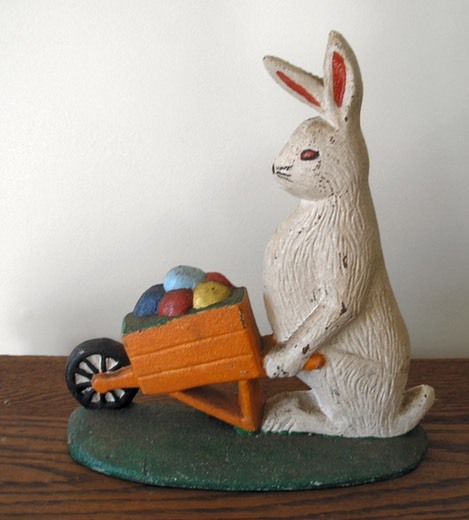 That Hubley solid Rabbit you have in the eMuseum was produced by Tom from a 1950s plastic statue. I remember Tom showing me one and how heavy it was.